All auditions are taking place in Room B112 on the Kelowna campus of Okanagan College (1000 KLO Road). There are roles for five men and five women. 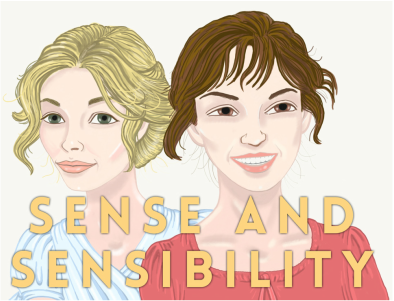 With the exception of the actors who play Elinor and Marianne Dashwood, all of the actors will play multiple roles. Auditioning actors will be asked to read selections from the script. They will not be required to memorize audition pieces. Rehearsals are going to start in January; performances will take place in mid-March. Please contact director Jeremy Beaulne at JBeaulne@okanagan.bc.ca reserve a twenty-minute audition time. See the audition schedule below to determine which time slots are still available. ELINOR DASHWOOD – the eldest Dashwood sister; sensible. MARIANNE DASHWOOD – the middle Dashwood sister; sensitive. MARGARET DASHWOOD – the youngest Dashwood sister; 10-13 years old. MRS DASHWOOD – the mother of the Dashwood sisters. JOHN DASHWOOD – half-brother to the Dashwood sisters (from their father’s side; no blood relation to Mrs. Dashwood). EDWAR FERRARS – a gentleman; a bachelor. FANNY (FERRARS) DASHWOOD – wife to John Dashwood and sister to Edward; nasty. COLONEL BRANDON – an older bachelor; over 45 years old. JOHN WILLOUGHBY – an unusually handsome young man. SIR JOHN MIDDLETON – a country gentleman; distant relation to Mrs. Dashwood. MRS. JENNINGS – a good-natured, boisterous woman; mother-in-law to Sir John and a terror to the countryside. LADY MIDDLETON – an over-bred lady. LUCY STEELE – a young girl from no fortune. ANNE STEELE – Lucy’s sister; indiscreet. ROBERT FERRARS – a callow young man; Edward Ferrars’ younger brother. GOSSIPS 1-5 – a chorus of high-society creatures. All auditions are taking place at the Okanagan College Theatre - Room B112, 1000 KLO Road, Kelowna.